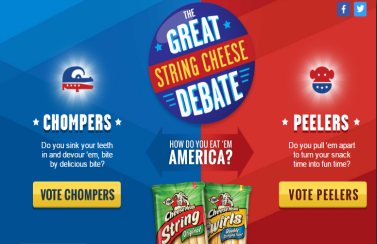 Frigo® Cheese Heads® “Great String Cheese Debate” Instant Win Game – Win a $500 gift card! Win a $500 gift card (10 winners)! ENTRY LIMIT – LIMIT: Entrants shall respect the following limit otherwise they may be disqualified: one (1) Game Play per person/per email and/or mailing address/per day during the Entry Period. ELIGIBILITY – Promotion is open to all legal US residents physically residing in the 50 United States and District of Columbia who are 18 years of age or older at time of entry, and have reached the age of majority in the state of residence. SWEEPSTAKES ENTRY PERIOD – The Saputo Cheese USA Inc., Frigo® Cheese Heads® “Great String Cheese Debate” Promotion starts at 12:00:01 AM Eastern Time (“ET”) on June 1, 2016, and ends at 11:59:59 PM ET on July 31, 2016. Five Hundred (500) free Frigo® Cheese Heads® String Cheese 12-count product each awarded as a free product coupon; ARV of each prize: $4.00.